The Da-Lite Lexington Multimedia Lectern with Microphone and Premium Sound System is a 48 x 32 x 22" floor lectern that comes with a microphone and premium sound system that provides 100W of RMS power. 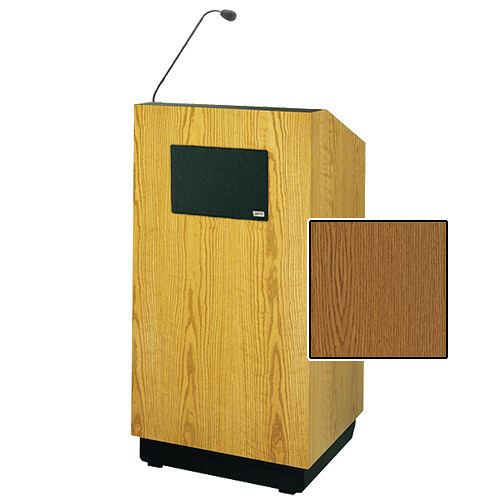 This lectern has a platform to do a complete computer-based presentation and can accommodate up to a 15" computer screen. It features a keyboard shelf that has a fixed-height pullout with a fold-down door, so the keyboard can be concealed when not in use. The adjustable equipment shelves can store a CPU or other equipment. This lectern is for 220V electrical systems only. The microphone has an electret-type, unidirectional element that offers miniature size and super sensitivity. It features a built-in pre amp, a slim and flexible gooseneck, and a male XLR connector to plug directly into the microphone input jack on the lectern.